Oh, the lands of Nuria Natal! Today, you bring us dread feats of the forgotten sands. You may cast one necromancy spell and one evocation spell as an Attack. After using this ability, you must complete a short rest before doing so again. Chosen in This World and the Next is a series of feats typically taken by the Chosen of Aten although other groups have similar practices. Once you set out on this path, you commit to taking this feat every time you could take a feat or get an Ability Score Improvement until you have completed your transformation. Those who step away from the process cannot return to it. By a series of strange tattoos, you gain Immunity to Necrotic damage. At this stage, your skin begins to look leathery. Your regimen of imbibing strange elixirs daily causes you to gain Immunity to Poison. You begin to grow gaunt and bony. Your eyes begin to sink into your skull and your pupils seem small and distant. You have wrapped your limbs in specially prepared linen strips. You gain a special attack, and your unarmed attack deals an additional 3d6 necrotic damage. If the target is a creature it must succeed on a Constitution saving throw or be cursed with Mummy Rot. The cursed target cannot regain hit points, and its maximum decreases by the amount of damage you dealt. If the curse would reduce the target’s hit point maximum to 0, the target dies and its body turns to dust. The curse lasts until removed by remove curse or other magic. You must complete a long rest before you use this ability again. You prepare your eyes with a special salve each morning and wrap your face in linen. You gain the ability to target one creature you can see within 60 feet. If the target can see you, it must succeed on a Wisdom saving throw against your glare or become frightened until the end of your next turn. If the target fails the saving throw by 5 or more it is also paralyzed for the same duration. 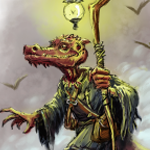 A target that succeeds on the saving throw is immune to your Dreadful Glare and that of all mummies, but not mummy lords, for the next 24 hours. You must complete a short rest before you use this ability again. You die via the ingesting of a special potion. You rise again the next day as a mummy. You gain all of the Vulnerabilities, Resistances, Immunities, and senses of a mummy. Additionally, the rest limitations on your Rotting Fist and Dreadful Glare are removed. You double your proficiency bonus for skill checks involving traveling through or avoiding the hazards of the desert. Actually you can. A mummy is simply the egyptian version of a zombie, only more powerful. Whereas The Chosen of Aten are devouts who transform into beings who are privileged among the dead and the living and thus can walk the line among both, hence the name. 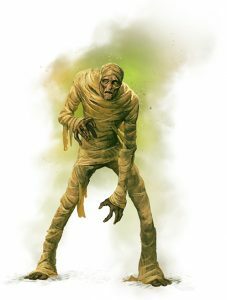 Lorewise, they are not an actual mummy, since that would involve also the lost of the self, and therefore it could not be a player anymore. They are higher than that. 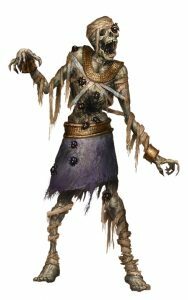 To try to measure the Chosen in the same way that a normal mummy its like trying to measure a lich in the same way that a zombie. 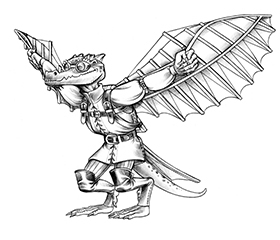 Also, The Dark Sun setting had a 10 stages transformation for a human to become a dragon, by the same token you could say “you can’t become a dragon creature by stages. You are either a Dragon or you are not”. But outside your own campaign and world, that is not your call to decide.